On my ad-free cooking blog I only post recipes that people tell me they love – some are healthy, some are not, but they are all delicious! I record these recipes because I love to cook, and people tell me they appreciate looking at and trying out my recipes. Please write a comment if you have any thoughts about my posts so I know if I should keep experimenting with new recipes, documenting them, and paying to keep this blog advertisement-free. Thanks for the feedback! Enjoy! I’ve been trying for a while to find the right way to do this. I tried one recipe that had cornmeal, and they were awful and cardboardy. And a lot of the recipes I googled were coated in potato chips – pretty much defeating the purpose of oven-baking. I wanted them to be delicious AND healthy – too much to ask? Apparently not! I just did what I usually do with breaded foods, but I added some yogurt to the egg coating to make them a little more tender. And yum, it worked! And it’s easy! 1. Crack the egg into a bowl and add the yogurt. Mix well with a fork. 2. Put the breadcrumbs in a bowl with some salt and pepper. 3. Cut the onion into thick rings, about 2cm wide. 4. Dip each ring into the egg mixture, then coat thoroughly with the breadcrumb mixture. 5. 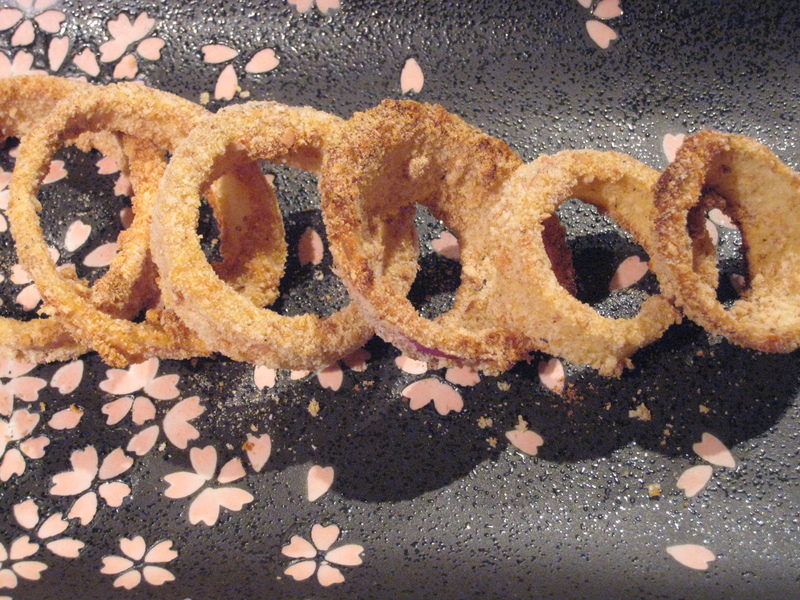 Place the breaded rings on a baking sheet and bake for 15 minutes at 400F. Flip the rings over and bake for another 10-15 minutes. They are done when they are quite browned. Serve with a yogurt dip. I like to add a bit of dill, salt and pepper to some plain yogurt. Adding some curry powder to the plain yogurt is nice too. Looks delicious Ms.Kim!!! 🙂 I want to try!! Hope you like them! Let me know what you think! Omigosh, yum! I’m so totally making these. Do you think I can use Greek yogurt? Yes, Greek yogurt is perfect for this. I used a homemade yogurt that is about 6%. Hope you like it!